5 Bedrooms | 4 Bathrooms | Sleeps 16 | Two Living Areas- Book 3 nights get 4th free!! Property Size 2,844 sq. ft. This recently redesigned, beautifully decorated poolside home is perfect for your Destin vacation needs. Gravity Bumps offers a spacious floor plan, which includes an impressive 5 bedrooms and 4 bathrooms, allowing ample living space for large families and groups. Our stunning home can comfortably accommodate up to 8 adults and 4 children. In addition to King Beds and bunk beds, we also offer a futon and sleeper sofas located around the home. Our well appointed Destin vacation homes are inviting, up to date, cozy, and stocked with some of the best amenities. Not only do we offer advanced high speed internet and flat screen televisions, but we also provide high definition cable for your television entertainment pleasure. We can't forget about our most precious of guests. High chairs and pack-n-plays are also available for the smaller children. Living Room: When you first walk into our open and spacious living area, you're met with views of exquisite crown molding and elevated ceilings that show a preview of the radiance of this grand vacation home. Updated features of our home include a brand new sofa and chairs. Flat screen televisions, throughout the home, also provide entertainment for your group. The living area is the ultimate place for everyone to wind down after a long day of sight seeing and beach fun. Your group can enjoy even more time together in the open kitchen and dining areas. With abundant seating, 8 people can fit comfortably in the dining area. The large kitchen counter comes equipped with additional seating. Kitchen: The accommodating kitchen area is adorned with beautiful custom, granite counter tops, chef worthy stainless steel appliances, and not one, but two ovens. We want you to make yourself at home as soon as you get here, so we have also included a blender, hand mixer, brand new dishes, cutlery and professional grade cookware. This kitchen has what cooks need in order to cook up fresh, tantalizing meals. Then, just before your morning stroll on the beach, coffee can be prepared in one of our two coffee makers. We provide a standard coffee maker and a state of the art Keurig K-Cup coffee maker. Check out the pantry to find it stocked with essentials such as creamer, sugar, a variety of spices, aluminum foil, and other staple items that you may need to make your stay convenient and comfortable. Laundry Room: Being able to clean swim clothing is a must, after enjoying some fun pool time. You will be amazed at how spacious the laundry area is in this vacation home. It is located just outside of the kitchen, and comes with a full size washer and dryer, iron and ironing board. Shelves are also available for your laundry storage needs. This home includes a King bedroom, which is conveniently located on the main level. This is perfect for guests who may be limited in taking the stairs or who simply prefer having access to bedroom on the main level. This massive, private bedroom is beautifully furnished with a brand new King sized bed. The bed is draped in an ultra soft, plush Egyptian cotton sheet set. The master bedroom also comes furnished with a dresser, nightstand, and a lamp for those late night relaxation and reading sessions. There is also a huge walk in closet, and the room comes with a HD Television to have access to the latest entertainment while away from home. Bathroom 1: There is a full bathroom located next to the King bedroom on the main level. It accommodates a grand vanity and beautiful, granite countertops. The bathroom is also adorned with a unique copper sink. Custom tile work is displayed on the shower and tub combination. We also provide a hair dryer and luxurious, plush towels. Master Suite: This stunning master suite provides the ultimate in bedroom amenities. It features sturdy, hardwood flooring, a King sized master bed, and plush Egyptian cotton sheets. The suite also includes night stands, dressers and lamps. There is also an included flat screen television, for your viewing pleasure. The room also comes equipped with a wet bar that features a sink, mini fridge and a microwave. For ultimate rest and relaxation, you'll also have access to room darkening drapes in this master suite. In addition, a private balcony flanks the outside of the room, allowing you to step right outside the suite to enjoy the view of the stunning lagoon pool. Bathroom 2: The master suite comes with a luxurious private bathroom, featuring a large Jacuzzi tub to help you unwind. Custom tile flows throughout the bathroom. The décor also includes a separate shower, dual vanities, and attractive granite counter tops. Inside of this well equipped bathroom, you will also find a hair dryer, plush towels, and a large walk-in closet. Bedroom 3: The third bedroom is also located on the second level of the home. It is furnished with a huge, King sized bed which is covered by comforting, Egyptian cotton sheets. The room also comes equipped with a flat screen television, night stand with reading lamp, and a dresser. Bathroom 3: This bathroom includes a tiled tub and shower combination, and a beautiful vanity and sink. A hair dryer and large, plush towels are also provided. It also includes a large walk in closet for your clothing storage needs. Bedroom 4: This lovely King sized bedroom includes a brand new bed furnished with a luxurious, soft Egyptian cotton bedding. The room is also furnished with a dresser, and nightstands with reading lamps. There is also a walk in closet with enough room for lots of clothing storage. A flat screen television is also provided. This room is located close to the kids bunk bed room, and is ideal for those parents who wish to be in close proximity to their little ones, but still have access to their luxury and privacy in a separate bedroom. Bathroom 4: This large bathroom is available for both guests residing in the main bedroom, as well as the kids bunk room. It features a bathtub and shower combination, luxurious tile décor, grand vanity, hair dryer and granite countertops. Large, plush bath towels are also available. This is the ultimate room, ideally for kids. It can comfortably sleep 4 children. Kids will love the space of the full sized, top and bottom, bunk beds with the aquatic fish themed bed covers. Children have no shortage of entertainment, with the included mounted flat screen television. For their storage needs, there is also a large storage closet located in the room. The third floor's grand living area is easily accessible from both bedroom 5 and the bunk bed room, where both kids and adults can spend quality time together. It is includes a sturdy wood flooring, a newly covered futon, and a queen size sleeper sofa. There is also an additional storage closet located in the living room. It also includes it's own wet bar. The state of the art wet bar comes fully equipped with a microwave, mini fridge, sink, and ice maker, for those late night snacks and drink runs. Just outside the living room, you will find the third floor balcony where you can sit out and relax, while taking in amazing views of the lagoon pool. Pool & Beach: This resort style home, located in the stunning Villages of Crystal beach offers it all, fun, relaxation, and rejuvenation. Take a dip in the nearby sparkling lagoon style pool with three waterfalls, and then relax in the spa. There is an abundance of seating for your group's needs. Get your feet wet, in the beach, which is minutes away. You can take a ride on the seasonal trolley if you are visiting with us during the time between Spring Break and Labor Day. 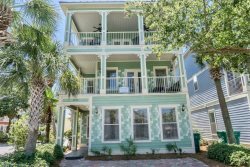 The elegant and charming seaside Crystal Beach community is the perfect setting for Destin Vacation Home Rentals. It is in close proximity to walking trails, upscale shops, leisure and restaurants of Hwy 98, yet just far enough to take a break when necessary. Gravity Bumps also includes driveway parking for two vehicles, with overflow parking available for groups. We want to make your vacation memorable, and deliver standards like no other. Did we mention we are also pet friendly? Contact us to book your Destin Vacation Home Rentals today! Great customer service! It was easy and enjoyable to book through Deborah.